The input of organic carbon being an indicator of organic pollution as well to the oceans provides crucial sources in food web of estuarine ecosystems. The Black Sea surrounded by six countries is the world’s largest land-locked inland sea and its total length of the coastal zone is 4,340 km, of which 1,400 km is shared by Turkey. The Black Sea receives annually a considerable freshwater input from the rivers carrying substantial loads of organic matter, nutrients and anthropogenic pollutants and the coastal parts are highly affected by eutrophication. The aim of this study is to determine the temporal variability of total carbon (TC), total organic carbon (TOC) and total inorganic carbon (TIC) carried from the eight Turkish streams to the Black Sea. The streams included in this study are Ağasar, Fol, Galanima, Değirmendere, Yomra, Karadere, Manahoz and Solaklı, within the boundaries of Trabzon Province, the most densely populated city located in the coast of Southeastern Black Sea. The water sampling studies have been monthly conducted in one station, which was selected at the point where the stream is discharged into the Black Sea, for each stream during a period of twelve months between March 2015 and February 2016. Considering the mean values for each stream, TOC concentration fluctuated from 1.59 to 25.90 mg/L and the Stream Yomra being under immense pressure due to various kinds of anthropogenic activities among which sand and gravel mining is the most disastrous one was the most critical one. The streams showed high TC and TIC yields during the summer and autumn months, corresponding to the seasonal trend of stream discharge. It was also found that TIC comprised the majority of the total carbon concentration, with mean percentages ranging from 68.9% to 84.06% in all of the streams.
.	Azizullah, A., Khattak, M. N. K., Richter, P., & Häder, D. P., Water pollution in Pakistan and its impact on public health—a review. Environment International, 37(2), 479-497, 2011.
. Anonymous. World Water Day 22.03.2010; 2010. Retrieved from www.worldwaterday2010.info, United Nations.
.	Bakan, G., & Büyükgüngör, H., The black sea. Marine Pollution Bulletin,41(1), 24-43., 2000.
.	Balkas, T., Dechev, G., Mihnea, R., Serbanescu, O., & Unlueata, U., State of the marine environment in the Black Sea Region. UNEP Regional Seas Reports and Studies,124, 47., 1990.
.	Bayram, A., Onsoy, H., Bulut, V. N., & Akinci, G., Influences of urban wastewaters on the stream water quality: a case study from Gumushane Province, Turkey. Environmental Monitoring and Assessment, 185(2), 1285-1303., 2013.
.	Boran, M., & Sivri, N., Trabzon (Türkiye) İl Sınırları İçerisinde Bulunan Solaklı ve Sürmene Derelerinde Nütrient ve Askıda Katı Madde Yüklerinin Belirlenmesi. E.U. Journal of Fisheries & Aquatic Sciences, 18,(3-4): 343 – 348, 2001.
.	Bozcaarmutlu, A., Sapmaz, C., Aygun, Z., & Arinç, E., Assessment of pollution in the West Black Sea Coast of Turkey using biomarker responses in fish. Marine Environmental Research, 67, 167–176., 2009.
.	Koklu, R., Sengorur, B., & Topal, B., Water quality assessment using multivariate statistical methods—a case study: Melen River System (Turkey).Water Resources Management, 24(5), 959-978., 2010.
.	Kumarasamy, P., James, R. A., Dahms, H. U., Byeon, C. W., & Ramesh, R., Multivariate water quality assessment from the Tamiraparani river basin, Southern India. Environmental Earth Sciences, 71(5), 2441-2451., 2014.
.	Tuncer, G., Karakas, T., Balkas, T. I., Gökçay, C. F., Aygnn, S., Yurteri, C., & Tuncel, G., Land-based sources of pollution along the Black Sea coast of Turkey: concentrations and annual loads to the Black Sea. Marine Pollution Bulletin, 36(6), 409-423., 1998.
.	TSWQR, Turkish Surface Water Quality Regulation. Official Gazette. no: 29327, Turkey, (in Turkish)., 2015.
.	Varol, M., Gökot, B., Bekleyen, A., & Şen, B., Water quality assessment and apportionment of pollution sources of Tigris River (Turkey) using multivariate statistical techniques—a case study. River Research and Applications, 28(9), 1428-1438., 2012.
.	Vieira, J. S., Pires, J. C., Martins, F. G., Vilar, V. J., Boaventura, R. A., & Botelho, C. M., Surface water quality assessment of Lis river using multivariate statistical methods. Water, Air, & Soil Pollution, 223(9), 5549-5561., 2012.
.	Wan, J., Bu, H., Zhang, Y., & Meng, W., Classification of rivers based on water quality assessment using factor analysis in Taizi River basin, northeast China. Environmental Earth Sciences, 69(3), 909-919., 2013.
.	Bulut, V. N., Bayram, A., Gundogdu, A., Soylak, M., & Tufekci, M., Assessment of water quality parameters in the stream Galyan, Trabzon, Turkey. Environmental Monitoring and Assessment, 165(1-4), 1-13., 2010.
.	Alkan, A., Serdar, S., Fidan, D., Akbas, U., Zengin, B., & Kilic, M. B., Physico-Chemical Characteristics and Nutrient Levels of the Eastern Black Sea Rivers. Turkish Journal of Fisheries and Aquatic Sciences, 13, 847-859., 2013.
.	Sorokin, Y. I., The Black Sea. In Estuaries and Enclosed Seas. Ecosystems of the World, Vol. 26, ed. B. H. Ketchum, pp. 253 – 291. Elsevier, Amsterdam., 1983.
.	Bayram, A., Onsoy, H., Akinci, G., & Bulut, V. N., Variation of total organic carbon content along the stream Harsit, Eastern Black Sea Basin, Turkey. Environmental Monitoring and Assessment, 182(1-4), 85-95., 2011.
.	Demirci, E., & Cuhadaroglu, B., Statistical analysis of wind circulation and air pollution in urban Trabzon. Energy and Building, 31, 49–53., 2000.
.	Visco, G., Campanella, L., & Nobili, V., Organic carbons and TOC in waters: an overview of the international norm for its measurements. Microchemical Journal, 79(1), 185-191., 2005.
.	APHA, Standard methods for the examination of water and wastewater, 18th ed. Washington, DC:American Public Health Association., 1992. ISNAD NACAR, Sinan . "Temporal Variation of Organic and Inorganic Carbon Transport from the Southeastern Black Sea (Trabzon Province) Rivers". 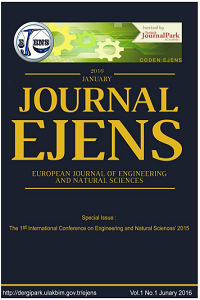 European Journal of Engineering and Natural Sciences 2 / 1 (February 2017): 149-153.